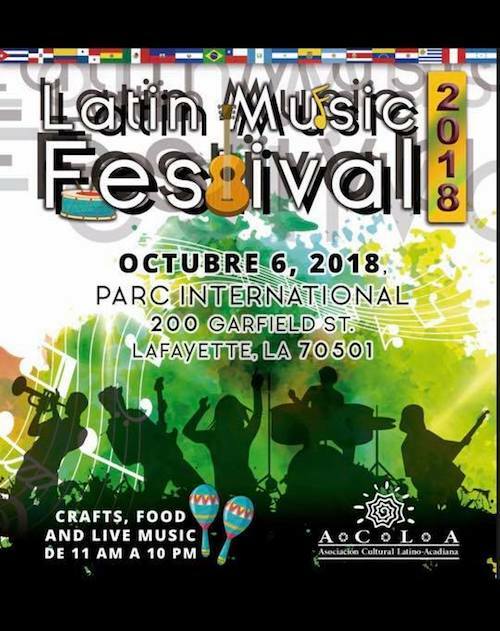 October is a busy month for fall fests in various forms, and, since 2002, now includes a festival that celebrates part of my heritage: The Latin Music Festival, this Saturday at Parc International. Growing up, I felt isolated from and ostracized by my peers, who had last names emblazoned on campaign signs and UL Lafayette’s buildings. Despite knowing there were tons of people of Latin American, Spanish, and Mexican descent in Acadiana, I did not see any indication of this in cultural celebrations at school or gatherings around town. There was no room for me between the bonnets and accordions. Having such a narrow focus of what constitutes as culture here has been limiting. If you don’t grow up seeing people like yourself in positions of power, you feel like you can’t relate to anyone around you. You feel like your peers do not care about your background because you’re different. You feel disengaged, unimportant. This is the story of the immigrant’s child. This is the story of slow and steady erasure and assimilation. When I first heard about the ACLA Latin Music Festival, I was both surprised and not surprised of its existence. I had long since abandoned any hope that anyone within the arts community was interested in tapping into the region’s Latino, Spanish, and Mexican population, and yet, here it was. An entire festival, free and multi-cultural, that featured Latin rock, salsa, folkloric performances, dance classes, a flag parade, Spanish immersion school performances and DJ sets. Since its inception in 2002, the Latin Music Festival has taken place on Oct. 6. Until I began writing this, I was unaware Gov. Kathleen Blanco established the holiday as Acadiana’s Latin American Day. This year, the celebration begins at 11 a.m. with a Zumba dance class. The Spanish Immersion school performances from students at Alice Boucher Elementary, Charles Burke Elementary, and Opelousas High School begin at 12 p.m., and the flag parade follows at 12:30. The youth talent contest begins at 1 p.m., followed by the children’s cartoon parade at 1:30 p.m. Celebrating another facet of the culture within Acadiana also opens doors for a variety of musicians, and we love dancing! The dancing begins at 2 p.m. with the Cumbia/Bachata act American Astros, then at 3 p.m., New Orleans-based Tierra Linda takes the stage for a Latin folkloric dance. At 4 p.m., DJ Showdown performs, and at 5 p.m. the Segovia Dance Company will conduct a salsa class. Latina Pulse plays its Salsa mix at 6 p.m., followed by New Orleans-based Latin rock act Manzanota at 7 p.m. Mariachi Jalisco closes out the festival at 8 p.m.
At both the nationwide and regional level, we are realizing how important representation is. If someone feels left out and underappreciated, they take their talents elsewhere. The focus becomes too small to see the big picture, which is full of other languages and colors and sounds than most realize. And that’s a shame. They’re missing out.